My friend Jason use ADSL and his Ubuntu9.10 machine can not connect to internet with the default network-manager come with Ubuntu 9.10.Everytime the machine startup,he need to type pppoeconf command and configure to access to internet.Here is how to fix this problem in Ubuntu 9.10.
append following to end of the file and save it. find and change “managed＝true” (without quotes). 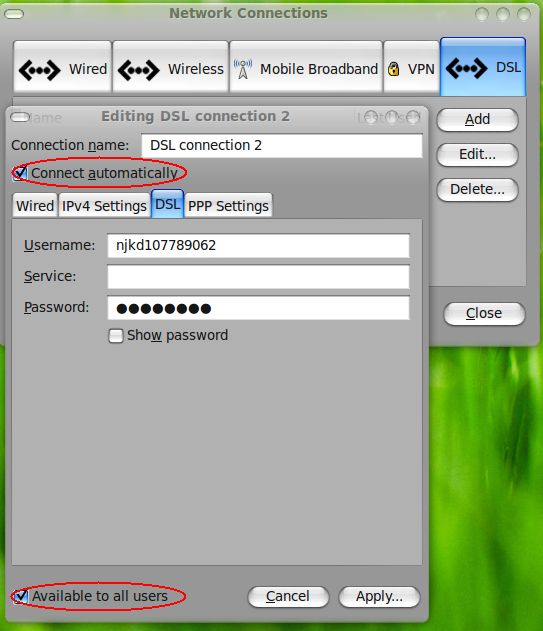 Step3:Add DSL connection to network-manager and make it auto-connect at login. Delete useless connection.In DSL tab,click Add and then input your Username and Password. Remember check the “Available to all users” (marked in picture) to prevent keyring locked problem. 9 users responded in " Fix DSL pppoe connection problem with Network Manager in Ubuntu 9.10 "
How do you accomplish step one if the problem is connecting to the internet in the first place? Can I download this on a Windows machine I’m on then move it over or something? 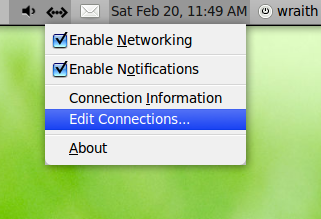 … or more simply, connect within ubuntu using ppoeconf before following the above instructions to fix the problem with network-manager. This gives you a working connection so you can download the files. You helped me to fix my internet connection! thanks. You give a useful direction and I fixed almost. My dsl established but it’s show weired is not connection. before was work great but after restarting gived me this box and nothing shwon in it , but when i did these instruction now its not recognize the DSL .